As casting techniques improved and foundries perfected the blend of coal dust and sand that comprised the sand cores of cast iron radiators, designers attempted to make thinner columns in cast iron radiators. 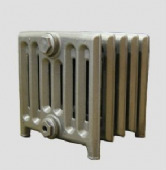 The narrower the column of the cast iron radiator the higher the surface area and therefore the higher the heat output. Column cast iron radiators were perfected by the CRANE company in the early twentieth century and as the skills developed by the CRANE company were copied several interpretations of column cast iron radiators appeared including the Neo-classic and the Victorian. Today, the Sovereign range is a slightly later 1930s design, but all of our cast iron radiators are authentic and cast in original moulds using traditional techniques.